The history of the Orthodox Church in India is mapped back to the year 52 AD. St Thomas, the disciple of Jesus Christ is credited with the establishment of Christianity across regions in the South of India starting from Cranganore. The role of the Church in the field of education within the country cannot be undermined. The Orthodox Church envisioned a futuristic agenda- to be of help to the society. Consequently, today this body manages several educational institutes and avenues for higher and professional studies. There are also healthcare institutes and a number of allied offerings like hospitals, old age homes, orphanages and destitute homes across Indian states. 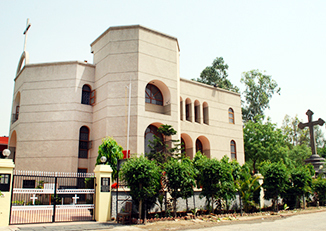 Much of our inspiration and dedication to start up with St. John's School, Greater Noida comes from the success and fruition of St. John's Model School, Mayur Vihar , Phase-1 which has successfully completed 12 years of dedicated service right from the year 2003 under the aegis of St John's Orthodox Church Society (Regd). This society is the local frame of the Indian Orthodox Church under the Diocese of Delhi. St John, widely believed to be the 'Apostle of Love' is the patron saint of our school. He was one of the most devout and beloved of Jesus Christ.